I bought ODST a few weeks ago, and until earlier this week, it was pretty much gathering dust. Not for the lack of interest, but lack of time and opportunity to play the game. I haven't gone far in the game in the last few days, but so far I'm liking it a lot. There's this sense of claustrophobia and vulnerability that changes the game play from previous Halo games. It's quite refreshing. Here's a well put together rap video of the storyline for Halo 3 ODST from the guys at JT Machinima. About an hour ago CCP Games released the trailer for their latest expansion and launched the Dominion site. Have a look and be prepared to be amazed once more! I really look forward to this expansion as the end of the year will see me have a bit more time to log into EVE in the evenings and play with my mates from Phoenix Labs; which is something that has been very difficult these past few months for reasons I'll explain in a later post. As for this expansion, it seems to me that they've out done themselves again if one looks at all the features that will arrive next week. Can't wait for it! Ever wondered what Earth would look like if it had rings, like Saturn's or Jupiter's? Well someone did wonder, and he created the video below. I wanted to share this video, not only because it's intriguing, beautiful and inspiring, but also because of the upcoming visual change that New Eden is about to receive when Dominion comes out on December 1st. I've already posted some of the videos of these changes that were taken on SiSi, the EVE test server, but an Earth-like planet with rings isn't something I saw, or even thought of. Maybe this is something CCP would consider and eventually roll out in the next few months. It would truly make New Eden even more majestic if it had a few of these Earth-ring planets! 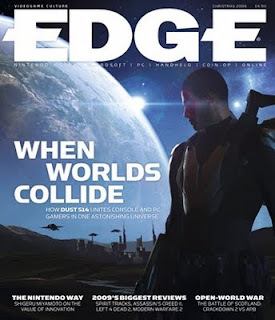 The latest issue of EDGE Magazine has the upcoming DUST 514 FPS as its cover feature. I'll be honest, when I first looked at that cover I thought I was looking at Sheppard from Mass Effect. It took a few seconds and a few words to realize I was looking at a character from DUST 514. So is this the look of what to expect when Incarna (aka Ambulation, aka Walking in Station) rolls out, hopefully by the end of next year? Subscribers are about to receive their shiny copies of the latest issue of Edge, featuring the debut of Eve Online maker CCP's FPS Dust 514. In shops on November 24. Though Eve itself is firmly based in Iceland, Dust 514, which is set in Eve's universe, is developed by CCP's new Shanghai studio. A MMOG shooter, Dust's battlefields are absolutely tied to Eve, with Eve players' corporations hiring Dust players to fight for control of planets for them. In other words, instead of the matchmaking being handled by heartless servers, Dust 514's action will be defined by Eve's players. And who better to try such a fascinating experiment than CCP? It is the developer which, in Eve, produced the most fascinating MMOG culture in the world. Have you ever dreamed of what EVE Online could be, or should be? Ever wondered what EVE could be in a 10 years, 5 years, or even next year? Well here's your chance to prove that you've got that game designer flame burning in you! It's little contest, simple in its elegance, and pleasurable in its rewards! Looking ahead to 2010, come up with either realistic predictions of new EVE features, or wild speculations of what might happen in game during the course of the year. What we're looking for here are the best, most accurate and entertaining, well constructed pieces of speculative reporting ever concocted about EVE Online, And the best 10 will make into the next issue of EON magazine, which comes out early January. Not only that, but I've been told that for those winners attending the next Fanfest, the folks at MMM Publishing will even chip in a beer token! These 10 best articles will be hand-picked by myself and EON Editor, Mr Zapatero himself! Your article has to be between 350 and 400 words. No more. No less. Stick to one prediction / one subject per 400 words. No formatting (no lists, bullet points etc). Take one in-game screenshot to illustrate your prediction. If it's in-space, please have it as high-res/spiffeh as possible. The 10 articles picked will each cover different subject (no more than 1 article about Incarna will be picked. We're looking for variety here!). Write your article on your blog, post the URL in the comments below. Your article gets published in the January 2010 EON issue. The contest starts today and ends on November 30th EDT. The 10 winners will be announced the following week! What will happen to out portraits once Incarna is released? Will Chribba still be the King of EVE? Faction Warfare needs some love, or does it? In this day and age of the InterTubes, it's nice to walk away from the digital world, find a nice quiet spot in the house, sit down on a comfy couch with a nice alcoholic beverage (say a Taylor Fladgate port or a Grand Marnier) and start reading a high quality, visually stunning & intelligently edited magazine such as EON. You may think that I'm stretching the truth here, just for the sake of you the reader, but the opposite is actually the case. EON has become an integral part of my EVE experience. And these days, with the sort of schedule that I have, it's a real treat roam through its A4-sized pages. 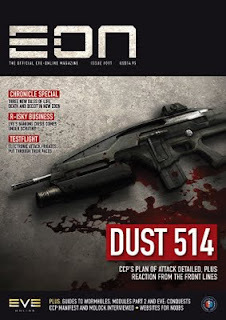 This latest issue - "EON #017 DUST 514" - is no exception to the rule. And with the lead article on the new and upcoming EVE console first-person shooter, how could it not be interesting! if they are as excited about DUST 514 as they should be. life on the frontiers of New Eden. EVE to see if it has a future and what it might look like. This is a guest post by @tladb which was originally a comment on my original World of Warcraft and EVE Online comparison. In an extreme case if you were the only player on a WOW server you could arguably still have an interesting time just doing the quests solo and exploring the world. (Sometimes it feels like this in less populated areas in Azeroth now.) In EVE this situation would be pointless. WOW is much more directed than EVE is sand-boxed. Basically all your activities in WOW are scripted by Blizzard. In EVE it is the players that direct the activities to a much greater extent. This means that after a new EVE player has finished the introductory quests it is up to them to find a role in the game. In WOW the NPC's will often direct you to the next area for quests. This may be the hardest thing to come to deal with. Are you going to be a pirate, a pirate-hunter, a miner or an explorer or even a corporation director, etc. In EVE these are all possible, but the player has to decide and then work out how to apply those skills. Especially since many of the occupations depend on other people. In EVE, the items are player-built. So if there is a popular item in EVE not only will that be available at a price but in the supply chain to provide that many EVE players could benefit. Even at a relatively early level you could be part of that chain. There is also the point that making and trading items in EVE is much more involved and and potentially more interesting in comparison to WOW. In WOW player guilds are much more casual with the more limited focus of providing a pool of players for raiding instances. There are no player stations in WOW, no pirate guilds or guilds in WOW with a bigger concept than just loot-runs. A WOW equivalent of a training corp like Eve-Uni for example would be completely baffling. I think it could be argued that the large majority of your enjoyment in EVE is determined by the corporation you join. One big shock in EVE to WOW players is that getting killed in EVE is more than the two minute inconvenience it is WOW. Your ship, which you spent hours, days or weeks to acquire is lost. There is the possibility that you may have lost weeks of skill training time if you have not kept up to date your clone. Death matters. This is seen as a positive aspect for EVE players, otherwise they would not be playing; but for a WOW player it's a major change. WOW has more of a physical presence than EVE. The places you visit are more visual so that just wandering around in WOW is interesting. Wandering into Ironforge, the strangeness of Sillithus, the workshow in deadmines, entering Outlands, just riding through Nagrand, the Deathgate sequence to name a few. Visually space in EVE is a bit bland, there are better NASA pictures, however in EVE the sights need to be created by the players themselves such as the large fleets battles (using my imagination here). In WOW you can send anything by mail. Horses, pets, money, food, complete suit of armors, anything. In EVE you can send money but everything else needs to be physically transported. You can buy an item on the market from a distant station but you need to fly to that station to pick it up. And warping is star-to-star, not instant warp to trade hubs which you can get in WOW. This is by design and provides a more dynamic environment for players; but it's still more inconvenient from a WOW perspective. In EVE there is no user interface API which allows player add-ons. This is arguably a weakness of EVE. External applications like EVEmon, to help training, or Eve Fitting Tool, ship fittings, would be in game in WOW. Entirely different users interfaces are possible in WOW and not in EVE. It would be interesting and beneficial to see what a mod community should do. EVE and WOW are two very different games with different objectives and quite different ways to play so it is not a question of better but what can you enjoy doing. Behind the Scenes Featurette on Avatar! - Watch more Videos at Vodpod. I originally posted the video of this short film way back in March. And though I've been waiting for Part 2 for quite sometime now, I've only been able to find this recut of that first part. Still, I can't wait for the follow-up act! So we're Monday, and though I usually post these sorts of videos on Fridays, with Halloween and a Birthday Party over the week-end, I missed my window of opportunity to post this on Friday. Nevertheless I still wanted to share this amazing trailer. The video isn't embedded since that feature was disabled on YouTube, so just click on the screenshot below and make sure to watch it in HD! Go see the trailer, then comeback and let me know your thoughts!